Located at the intersection of U.S. Highways 62 and 283, Altus is the county seat of Jackson County, which was originally part of Old Greer County. Altus has continued to grow as an economic and medical hub of southwest Oklahoma. 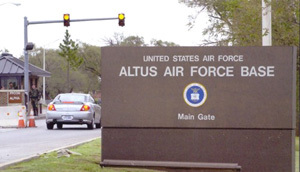 Since 1942 Altus Air Force Base has been the city's economic cornerstone. 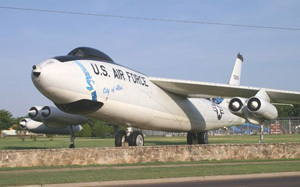 Other major employers include Altus Athletic Manufacturing, Luscombe Aircraft Manufacturing, Republic Gypsum, Jackson County Memorial Hospital, and Bar-S Foods Company. The Lugert-Altus Irrigation District, completed in 1947-48, furnishes water to the local agricultural area, where wheat, cotton, and grain sorghum are grown. Public education is provided through nine schools, with 482 employees and 4,198 students. The Southwest Technology Center has an enrollment of 5,772 in day and evening classes. 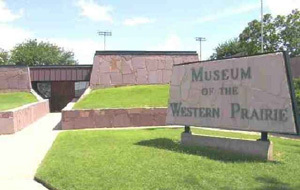 Higher education is available at Western Oklahoma State College. Altus is a Main Street community. In 1955 it was chosen as an All American City with the slogan "A City with a Future to Share." Population peaked at 23,302 in 1970. At the turn of the twenty-first century Altus, home to the Museum of the Western Prairie, had 21,447 residents, seven banks, and forty-three churches. The city maintained an aldermanic form of government. Following the Civil War, cattlemen seeking a shorter route to northern markets used the Great Western Trail near the future town. Altus was originally known as Frazer, a small settlement of approximately fifty people located on Bitter Creek. Cowboys often stopped for cold buttermilk at the John McClearan dugout, and Frazer became known locally as Buttermilk Station. The Frazer post office was established on February 18, 1886. On June 4, 1891, a flash flood almost destroyed Frazer. Residents moved two-and-one-half miles east to higher ground, and W. R. Baucum suggested renaming the town Altus, a Latin word meaning "high." From July 10, 1901, to May 14, 1904, Altus was called Leger, the name of a railroad official's father-in-law. At 1907 statehood Altus had 1,927 residents. In 1908 a spirited campaign arose between Olustee and Altus for the county seat. Altus won with 2,077 votes, as opposed to 1,365 votes for Olustee. 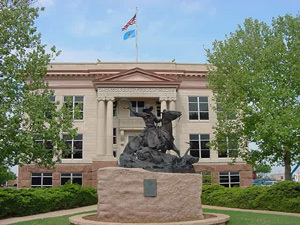 The Jackson County Courthouse (listed in the National Register of Historic Places, NR 84003064) was built in 1910. Early-day newspapers included the Oklahoma Democrat (daily and weekly), the Altus Times (weekly), and the Altus Weekly News. Railroads brought prosperity to the area. In 1908 the Kansas City, Mexico and Orient Railway (acquired by Atchison, Topeka and Santa Fe Railway in 1929) built a line through Altus. The Altus, Wichita Falls and Hollis Railway (which became the Wichita Falls and Northwestern Railway in 1911, acquired by the Missouri, Kansas and Texas Railway in 1922) constructed a line from Altus to the Oklahoma-Texas border. By 1930 Altus was a major regional agricultural trade and distribution center with eight cotton gins, two cotton compresses, and eighteen wholesale businesses. During the 1930s Works Progress Administration building projects included a National Guard armory, a city hall, and a public library.